Older dogs can also make great companions. Our Siberians have kept us healthy. We walk about six miles a day with them because we live in a townhouse with no back yard and we think that is quite an accomplishment for a man with a hip replacement and a woman who had an unsuccessful foot surgery. We think a younger dog might require more exercise and require younger owners. Our walks are special times. If one of us is out of town or ill, we are jealous that the other spouse got in an extra walk! We have established a routine that works for us. Dad does the morning walk because it takes Mom longer to get ready for work...it's a female thing. We hire someone to come in and do a noon walk. It became necessary when our first boy had a digestive problem and took steroids for a short while, which made him drink more. After he no longer required the steroids, we thought, "Hey, it doesn't cost much and he deserves some extra love and care at his age." Our current resident Siberian usually takes his evening walk at 7:00 or 8:00 pm and doesn't need to go again until morning. We have offered him a walk at 9:30 but he sometimes doesn't want to bother because he's already settled for the night! Although Zen doesn't need a dog walker at noon; we just think he deserves it. One of us arrives home between 3:30 and 4:00 and this walk goes to whoever arrives home first. Mom takes the night walk every night at 7:00 pm. 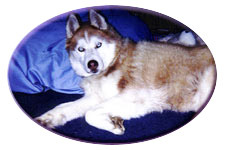 Our first boy, Sebastian, is featured in the Rainbow Bridge Memorials. We know that his third owner, who had him for a year, adopted him from a local SPCA. His third owner is a friend of a friend who adopted Sebastian for his eight-year-old son. Sebastian bonded with the father rather than the son, however, so they got a puppy for the boy. However; when the wife was expecting again, she said she needed a bigger house or one less dog. Sebastian's papers came with him from the SPCA and this third owner contacted the first owner, who was very surprised to find out the family they gave Sebastian to had put him in the SPCA. They said he was destructive when left alone. We suspect with crate training, Sebastian would have not been homeless twice. By the time we met him, his destructive years were behind him. We picked him up on a Saturday and put him to bed on the floor in the bedroom Saturday night. He slept there without a peep that first night and every night for the rest of his life. 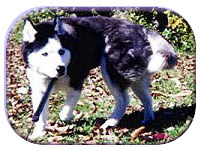 Our second boy, Zen(formerly Nikita), is featured in the success stories section. He was an outside dog for his first ten years but will be a spoiled, indoor boy for the rest of his life. He did sleep indoors on the bed with his first Daddy sometimes, but was only allowed in one room. Zen arrived on a Saturday and settled in right away. He slept on the bed the first night without a peep and will continue to sleep wherever he wants for the rest of his life. We used a crate on Monday when we went to work. We quickly found out that he, too, was trustworthy in his golden years.